They’re right. God isn’t fixing this. Yesterday, 14 people were slaughtered at the hands of at least two gunmen who mowed down innocent people in San Bernardino for a still unknown agenda. It was yet another senseless tragedy in our nation, on the heels of several mass shootings that have left us numb. So many of us were left to ask WHY. Why does this keep happening? Why isn’t something being done? How can we change this? We’re left feeling helpless, feeling like there’s nothing we can do. And so, those of us who pray, PRAY. We pray for the victims and their families. We pray for our nation. We pray for our leaders, and for answers. We pray that this war on ourselves will cease fire, that we’ll embrace peace, that we’ll live in harmony. And we pray for our children, fearful of the world we are handing them. Our leaders are praying too, offering their thoughts and prayers with the family through posts on social media. And while their sentiments are likely sincere, they are also leaving a bad taste in the mouths of many who believe these leaders could be doing more. I can’t even begin to tell you how angry this headline makes me feel, which means this newspaper is doing their job. Media outlets are competing for our attention, and the best way to do that is to incite some sort of emotional response to get us to react. This newspaper doesn’t care about God’s part in this tragedy. They care about our reaction to the word GOD, and are hoping we will respond, negatively or positively, just as long as we are talking about THEM so that their traffic goes through the roof. I guess I’m helping that along, now aren’t I? Here’s the thing, though. They’re right. God isn’t fixing this. I mean, how can he when we’ve done such an awesome job of pushing him out of our lives? God isn’t fixing this, but don’t mention him in public because you might offend those who don’t believe the way you do. God isn’t fixing this, but keep him out of our schools. God isn’t fixing this, but don’t tell me how to live my life. God isn’t fixing this, but remove the word GOD from everything. God isn’t fixing this, because we’re not fixing this. Here’s the thing. God is not some convenient genie in a bottle. His job isn’t to grant our wishes or mend everything we screw up. We are also not his chess pieces. He doesn’t sit there, plotting our every single move. He doesn’t force our actions. He doesn’t even force us to follow him or his ways. He’s granted us FREE WILL, offering the gift of choosing how we will live our lives, as well as the freedom of living with the choices we make. Sometimes our choices are good. Sometimes they’re not. And hopefully we’ll learn from those choices and become wiser because of them. Thing is, we live in a world where everybody gets to make choices in their lives. And sometimes those choices don’t just affect them, but the people around them. Sometimes they affect people on a much larger scale, even. This can be a good thing, like when people encourage others to do good through their own actions of kindness. But it can also be bad, like when someone picks up a gun and kills others for no other reason than to wield power and send fear through the nation and the world. This is what happened yesterday, and in every other mass shooting we’ve experienced through terrifying news stories. And as we watch the details unfold, held captive by the images we see on the screens or read about in the papers, we feel helpless, filled with sorrow, and unsure what we can do. The NY Daily News called the action of praying “meaningless platitudes.” I call it a good start. We should all be praying for our nation. We should be praying for our leaders. We should be praying for change. We should be praying for answers. And then, we should listen. Because God isn’t going to step in and fix this. But he will use us to make things right. If we all we do is pray for God to fix this, things will never change. But if we pray about how God can use us to change things, and then let him guide us, change will happen. The NY Daily News may have used their headline to cause anger on both sides of the fence, particularly among those who just read the words “God isn’t fixing this,” and leave it at that. But I encourage you to see those words and let it inspire action. God isn’t fixing this, because he believes YOU can. The other day I took time away from everything to come back to center and find the answers to some very serious dilemmas in my life that have been plaguing me. I called it my soul retreat, as it was time I had set aside to get back in touch with my soul. My biggest takeaways from this experience were to BREATHE and LOOK AROUND—as in, take advantage of every free moment in my life to just do NOTHING. You can read more about that in part 1. Before I left for this personal retreat, I had to have a game plan. So I mapped out a course. The first thing I did was to decide WHAT I would be addressing. I think that was probably the most important part of this whole exercise. If I didn’t know the WHAT, I wouldn’t have been able to find the answers I was seeking. I know that sounds so basic, but sometimes we don’t know what it is that’s bringing us down in our lives. By identifying these problem areas, I am being very clear on what I hope to accomplish. 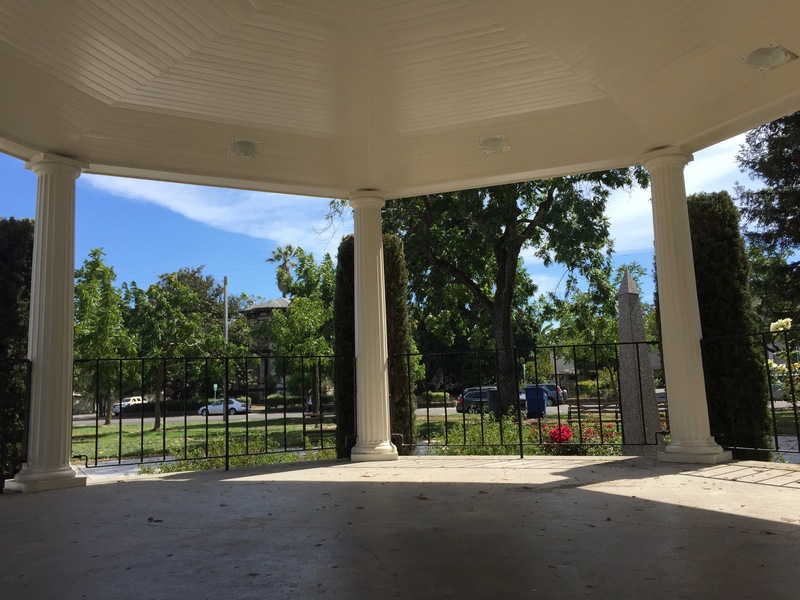 The gazebo at Walnut Park in Petaluma. Next, I chose different places where I would be tackling each issue. For me, there were three things I wanted to address. So I chose three different places I would be traveling to throughout the day. My biggest rule about these places were that they couldn’t be at home. If I stayed home, I wouldn’t be able to relax. So I chose places that spoke to me with each issue, places that would bring me a sense of peace as I tackled each issue. 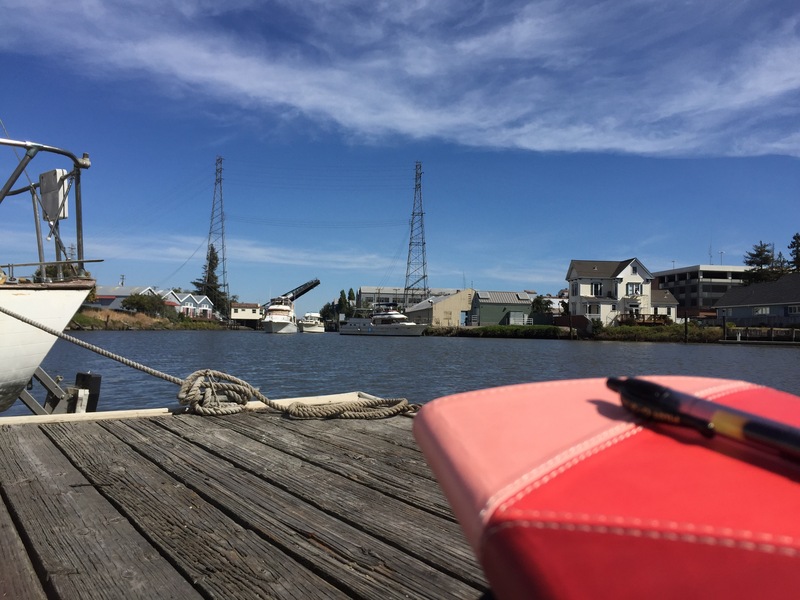 My new favorite spot in Petaluma, the boat dock with a view of the bridge in the Turning Basin. Expect my new novel to be written here…. Third, I armed myself with wisdom. For me, that meant finding scripture that addressed the very issue I was struggling with. For you, it could mean a few inspirational quotes, a poem, a passage from a book…anything that speaks to you, and is about the particular issue you’re facing. I recommend that you find at least three pieces of wisdom for each dilemma you hope to tackle. Read wisdom and meditate on the words. Pray/focus on wisdom and the issue at hand. Be still, remain open for answers. 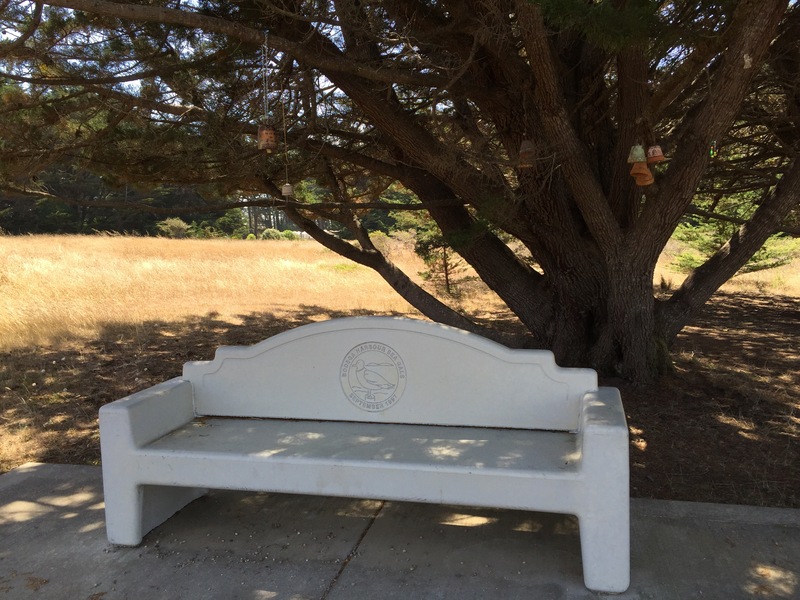 A bench at the Children’s Bell Tower in Bodega Bay. Expect more on this in a future post. The place is really amazing. Here’s the funny thing about the wisdom I chose before I set out on my journey. When I chose it, I knew that it spoke to me. But I didn’t know how it would speak to me in the moment I would be meditating on it. As I focused on each passage I chose, there were certain words or ideas that would ignite inside of me, almost as if a light bulb went off. The words I chose in the morning ended up holding a brand new meaning as I meditated on them, offering me new insight into the dilemma I was facing. I ended each session journaling what I had experienced, as well as offering a prayer of gratitude for the answer I had received. Journaling was an important aspect of this process, as it helped me to formulate what I had just experienced, and to ensure I wouldn’t forget. As for gratitude, we should always be grateful when God/the Universe meets us where we are and provides us with a path. When I was done with my three issues, I came back home. The kids were already home from school, so I said my quick hellos. Then I locked myself in my bedroom for an hour, with a note to not bother me until that hour was up. I did a half hour of yoga, and then I took out my journal for the final time to record my takeaways from the day. And I’ll repeat those takeaways here: BREATHE and LOOK AROUND. If you decide to gift yourself with a soul retreat, I hope you’ll share your experience with me. Not the whole thing—that’s between your soul and God/the Universe. But let me know if it helped you to reach the answers you were seeking. Yesterday, I took the day off of everything to come back to center and seek answers to the path I need to take in some very perplexing areas of my life. 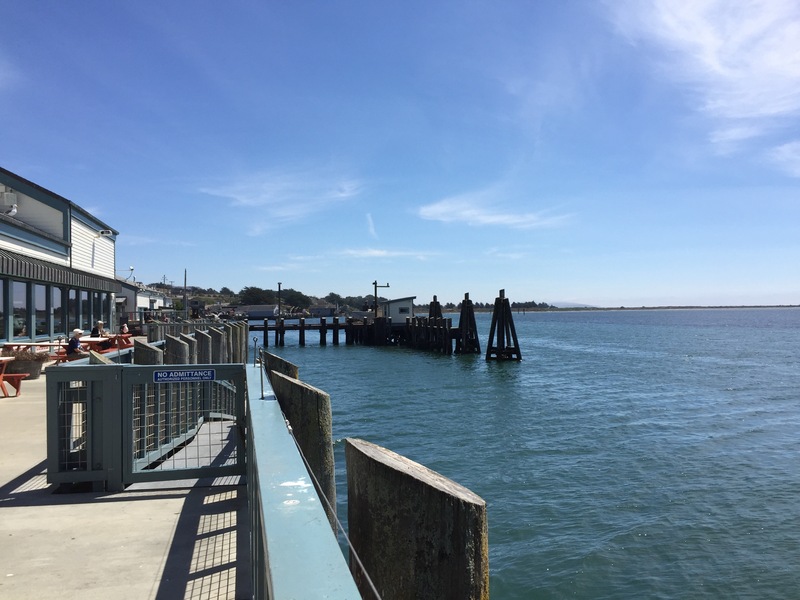 I called it my soul retreat, as it was my chance to reconnect with my soul in ways I hadn’t been able to for months. Let me start out by saying that the day was a success. I accomplished everything I had hoped I would, and received some very clear answers to my dilemmas, offering me a sense of peace. I won’t share all of these here, as they are very personal. But I do want to share some of my experience. Because this is kind of long, this post has been broken into two parts. The day started out with a drive to the coast. I set my drive to the soundtrack of Sigur Ros, one of my favorite bands for getting out of my head and immersing myself in the task at hand. Usually, it’s my writing music. Today, it was my transition from a too-busy life, to time with my spirit. I was battling two overwhelming emotions on this drive: fear and hope. I was hopeful that I would find the answers I was looking for, and looking forward to this time I’d set aside to seek them. But I was fearful that I wouldn’t find the answers. Even more, I was afraid I would find the answers, but they wouldn’t be ones I was happy with. There were tears on the drive, and it took almost the whole Sigur Ros album to get there. I found the exact portion of the coastline I’d envisioned, and pulled into a parking spot that faced the ocean. Then I let the album finish out as I stared out at the ocean, losing myself to the vastness of the sea. When ready, I came out of the car and found a spot on a picnic bench. I brought with me a box of Kleenex (which I had to buy on the way there since I’d forgotten! ), and my journal. 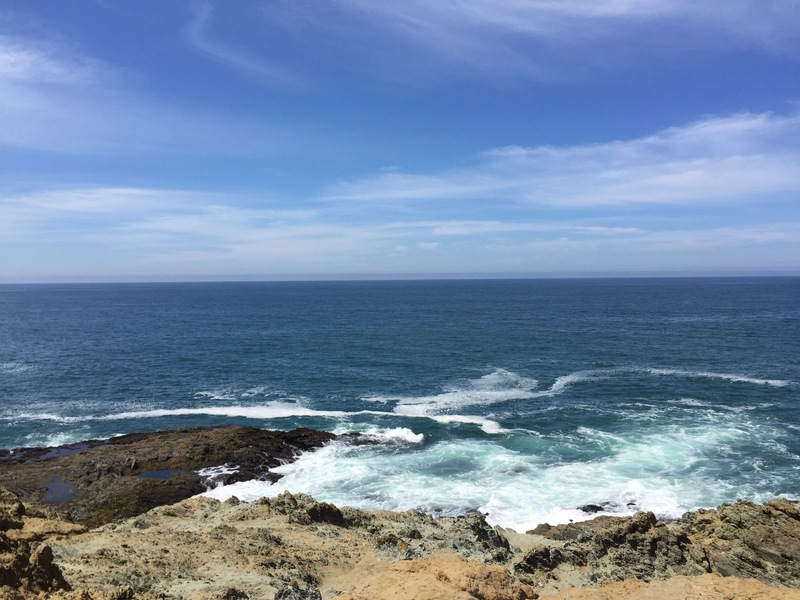 Then, as I watched the waves crash against the rocks below, I began my soul retreat. Throughout the day, I felt myself being told two things: BREATHE and LOOK AROUND. These were the central answers to the dilemmas I brought to the table. Take a deep breath in and let it out slow. Pause. Take a moment. Open your eyes. Look at your surroundings. Breathe. Most of my stress has been the result of extreme busy-ness. In my life, I have many hats I wear throughout the day, and it’s hard to not feel pulled in all directions. But that busy-ness isn’t necessarily caused by those different hats in my life, it’s really about what I do with the time in between. Let me ask you, what do you do when you’re bored? How about when you have a moment when nothing is being asked of you? How about when you’re waiting for dinner to be done simmering? What do you do the moment you wake up, or right before you go to bed? For me, I reach for my phone. I check my email. I peruse Facebook. I check my book stats. I watch interesting videos. I play a game. I do anything that will keep me from doing nothing. I remove myself from being where I’m at, and place myself in dozens of different places via my phone in a matter of minutes. This is true for many of us. And in doing this, we’ve lost the ability to just sit and breathe, and to be aware of our surroundings. We’ve forgotten how to see the world around us. Maybe it’s because life is unpredictable. We can’t control what happens to us in the real world. We can’t control the hurt, the anger, the sadness, the boredom, the fear. But when we’re immersed in a little 2”X3” screen, we can control everything we watch, feel, and experience. We make ourselves feel better through a heartwarming video. We share a moving article and feel like activists. We comment on a friend’s Facebook status and feel as if we’ve socialized. But we’re not living in the moment. Me. I have not been living in the moment. I’m not allowing myself time to breathe and take in my surroundings. I’m filling my pockets of free time with moments of busy-ness instead of taking a deep breath in and letting it out slow.